This entry was posted in Uncategorized and tagged cake, dessert, hawkeye, superhero by christao408. Bookmark the permalink. lolol – a cake for all those young at heart! 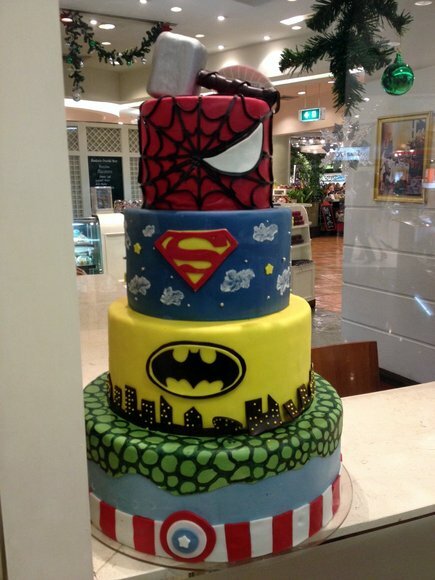 That is a Marvelous cake! Oh, that IS cool. I bet it was pretty pricy too. I would have love to listen in on the conversation you had with the boy. Now that is an amazing cake, and I agree little boy cake. This cake is amazing – I would love it as well, but definitely the best cake ever a little boy could receive. @ElusiveWords – It was a rather circular conversation as conversations with the very young and the very old can be! SNap, that’s a good looking cake! I’ve never actually tried eating a cake made like that, how do they taste? Drool! Not for the cake, but for Hawkeye! hahaha! I would also have loved to join in on the conversation, well maybe after your conversation with the boy and go on and on about how HOT Jeremy Renner is. hehehe. Whenever I talk about him I get all red in the face. Chris thinks I’m weird. He was totally laughing at me when we went to see Avengers and Bourne Supremacy. Sorry, totally went off topic, but you definitely got me at Hawkeye. yum!!!!! i think Hawkeye is not that popular internationally. or maybe hollywood has yet able to make them popular. but don’t crush that boy’s believe that Hawkeye is a true surperhero, instead of a human disguised as a superhero. that might turn him off from being a big fan. and as far as that cake goes, i think it is the perfect cake to have at a marvel comic convention. @rudyhou – And DC, too. @SherryAngeLMysteriez – He thinks the underwear is too red? That’s funny. @tribong_upos – @brooklyn2028 – @swcheng15 – @PinkGlitter02 – @mizz_chan – @Grannys_Place – @Fatcat723 – @chronic_masticator – @murisopsis – Val really took the pun out of my mouth when she wrote that is was a Marvelous cake. @tehls – He’s been quite the character actor and then has suddenly become a leading man. @secade – Am going to guess that it isn’t a real cake and is just a decorated display… so probably taste like cardboard!